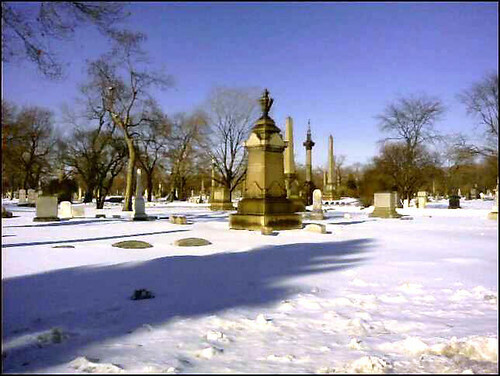 It’s not exactly obscure, but Graceland Cemetery, located along Clark on the city’s north side, does constitute a kind of urban dead zone (ha! ), a massive bump separating Wrigleyville, Uptown and Andersonville. A brick wall topped with barbed wire surrounds the 119 acres of gently rolling greenscape, hinting at a history of needing to protect itself from the crush of the city around it. Within the walls, however, awaits a pastoral Victorian funerary park quite at odds with the roaring L to its east and the urban hustle all around. 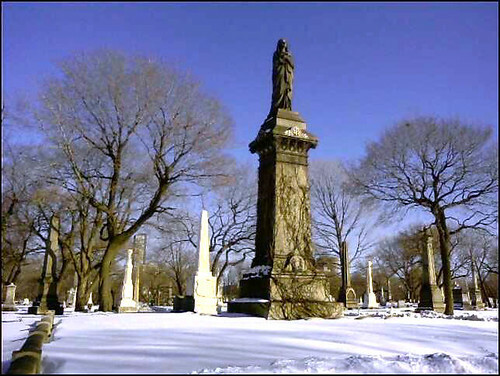 Within, many famous Chicago citizens are interred, including quite a few of architectural interest: Louis Sullivan; his 1960s champion, preservationist Richard Nickel; Mies van der Rohe; Daniel Burnham; his partner John Wellborn Root; and many others. Sullivan left his mark on the place with two tombs, including the famous Getty Tomb; the rest of the headstones, memorials and mausoleums are likewise rich in ornament and style, if not originality. More than anything, it’s an oddity among the furiously insistent urban madness of Chicago, which historically has had a tendency to devour whatever non-commercial entity got in the way of its relentless development. And it’s still an active cemetery! For as little as $2,600, you too can be laid to rest there, in the considerable empty land that still remains. This entry was posted in Cemeteries and Mausoleums, Louis Sullivan, Uptown. Bookmark the permalink. ← Devon Avenue in Danger? Did you visit Richard Nickel’s grave? That didn’t read as intended. If only modern life came with a complimentary copyeditor to cope with the vicissitudes of online context loss. What I wanted to say: Visiting Nickel’s grave gives cold perspective to the goals and dreams of those of us who hope to, in some way, prevent wanton demolition of the built environment. That our lives are lives like any other, subject to risks and open to devastating loss. That every time we enter another abandoned husk we are that much more grateful to exit alive. I’ve made the pilgrimage to Mr. Nickel’s resting place several times, and felt moved every time.